Action pages are way better, way more effective, and way more empowering than simple online petitions. 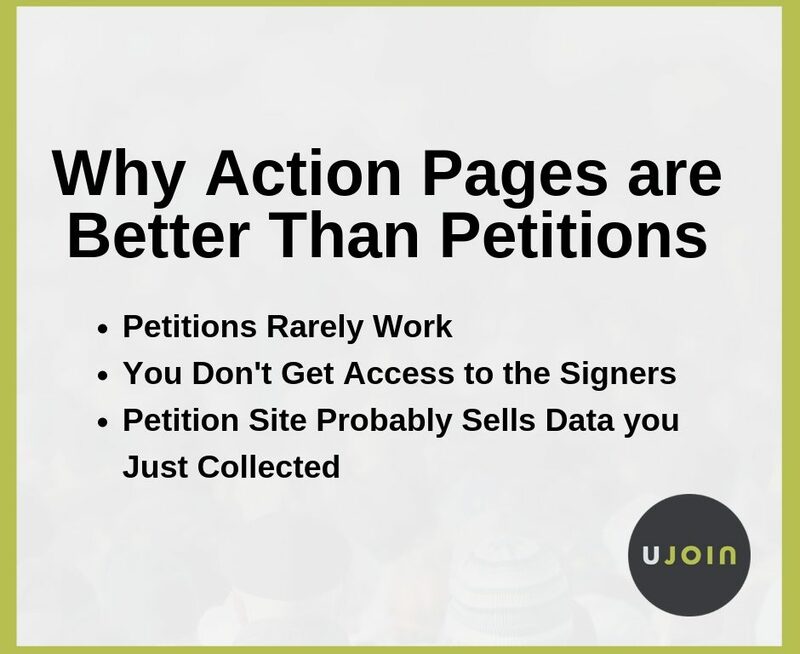 We need to make a clear distinction between online petitions and online action pages. Online petitions simply collect a bunch of names around a cause or idea. Action pages, on the other hand, allow you to easily send direct messages to decision-makers. The messages are in the form of direct emails, tweets, and phone calls. The decision-makers are city/county councilors, department chairs, legislators — or anyone, really whom you want to influence. They rarely work to get your desired outcome. Unless you’re collecting tons and tons of names and then the media picks up on that, petitions rarely work. What happens is you make all of the effort to spread around a link to you petition, then a bunch of people sign it, and nothing happens. Ideally, after you’ve found a whole bunch of people who sign a petition, you want to follow up with those people and engage them in whatever cause/goal you’re working toward. You can’t do that with most online petition sites. Booooooo. You just did a bunch of work to get people to sign your petition, then the petition site collects the data (about who feels which way on which issue) and then likely sells that data. You just did a bunch of work and the petition site gets all of the benefit. That’s totally lame.